It’s about time I put together a maternity-specific fashion post for you pregnant mamas out there! It’s been so fun hearing from you and knowing we are pregnant at the same time. Even if we’re not pregnant together, it still feels good to know all mamas are connected through our shared experiences of motherhood. I’m currently 32 weeks along and although it’s been pretty rosey and sunshiney up to this point, now I’m starting to feel all those unpleasant things that can come along in the last trimester. I’ll share more on this at my next pregnancy update in a few weeks, but I’ll warn you to only read it if you want to hear the nitty gritty downside of pregnancy! #notallsunshineandroses #stillworthit Maybe you can relate right now? 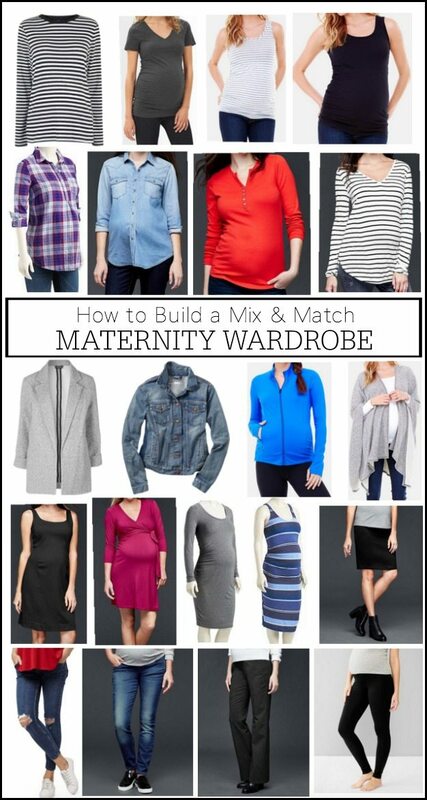 Today, I’m sharing with you how to add to your existing wardrobe a good foundation of maternity pieces that will keep you looking stylish during your pregnancy. We don’t have to be frumpy or disappear into the fashion background just because our bodies are expanding and bringing life into the world! 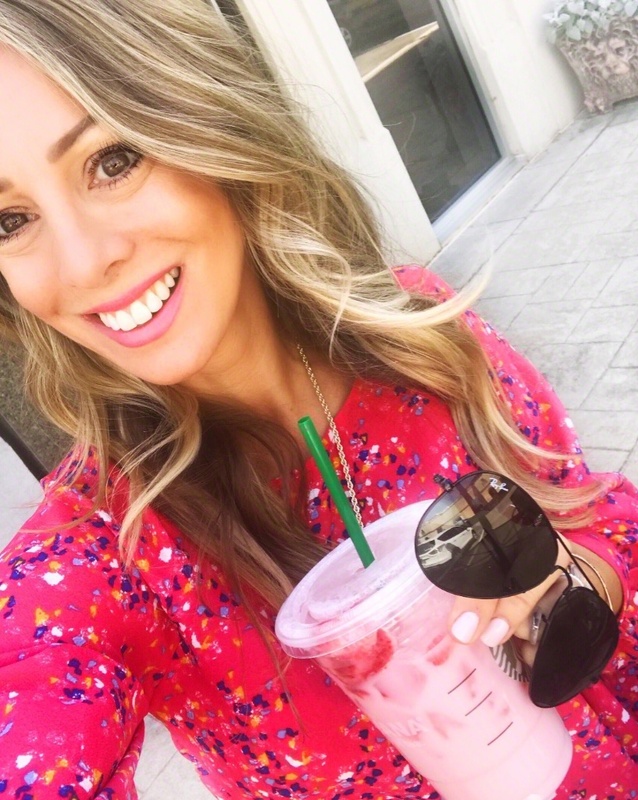 I learned the hard way that you actually can look good during your nine ten months of pregnancy by staying in shape and finding maternity pieces that fit and flatter. And I also know how bad I could look when I didn’t know how to dress my pregnant body with my first baby. The pieces I included below are great basic, stylish items that will get you on your way since you can mix and match tops and bottoms. Because these pieces are basics, you can add your own flavor to them with accessories, layering pieces, bags and scarves, and also incorporate them into your non-maternity wardrobe to create more maternity outfits. Just because you’re growing a tiny human doesn’t mean you have to sacrifice your personal style. If you liked wearing color and pattern before, you can continue to rock that look. If your style is minimal, stay minimal. If you just wear whatever is available without staying true to the style you enjoy wearing, you won’t feel like yourself during your pregnancy. That was so me the first time! I’m typically in neutrals with some brights thrown in and I love stripes so my current pregnancy wardrobe reflects that as well. Below are the tops I’ve bought this pregnancy, several of which are reflected in the graphic above. Although you’ll likely outgrow your pants and jeans, many tops (especially longer styles like tunics, long shirts, shirts with ruching on the sides, loose fitting button-downs, and skirts or dresses with elastic waistbands) will fit through much of your pregnancy.This ruched dress is non-maternity and I was able to continue wearing it for several months into my pregnancy. For a basic long sleeve top, I just ordered a size up (medium) and it fit well. Necklaces, earrings, bracelets, scarves, belts are all great ways to continue to add that extra interest and pizazz to an otherwise boring outfit. 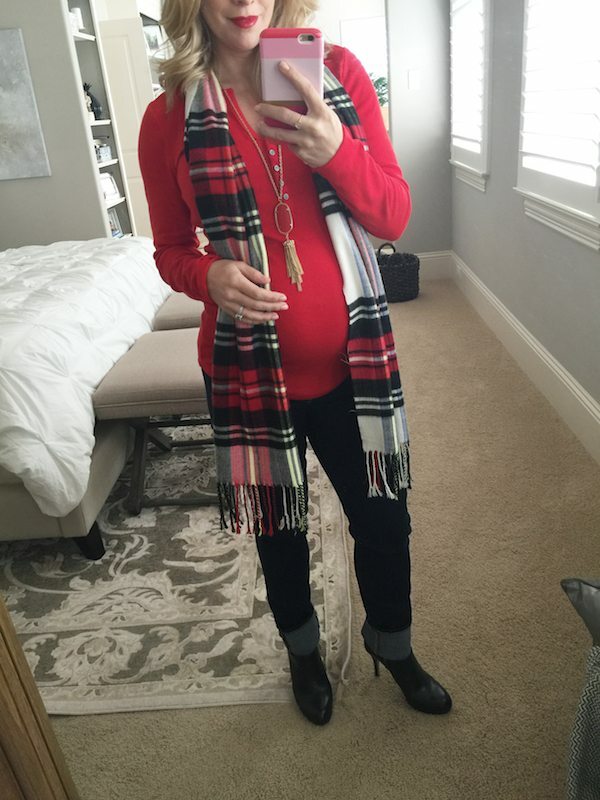 Below, I’m wearing a long sleeve maternity top and maternity jeans, but added in a scarf (similar here), necklace, ring, and booties (similar). For a slightly different and warmer look, you can layer on a puffy vest (similar) and knee high boots (similar). Sometimes, wearing something big and baggy will just make you look frumpy and even bigger than you really are. Wearing clothes that skim or hug your body can actually slim your silhouette. Trust me, I know what I’m talking about judging by the two pictures of me below. Why, why, why did I leave the house in this “don’t” outfit?! Why, why, why didn’t somebody stop me from wearing THOSE JEANS?!?! Granted, I was bigger in the second photo, but my choice of “fashion” certainly didn’t help things! See how much better the striped top below looks than the white one, even though they’re both long sleeve tops? The striped one fits more snugly to my body, but the white one has no shape and is just hanging, making me look like Olaf (but not as cute!). That do/don’t photo above illustrates this point! 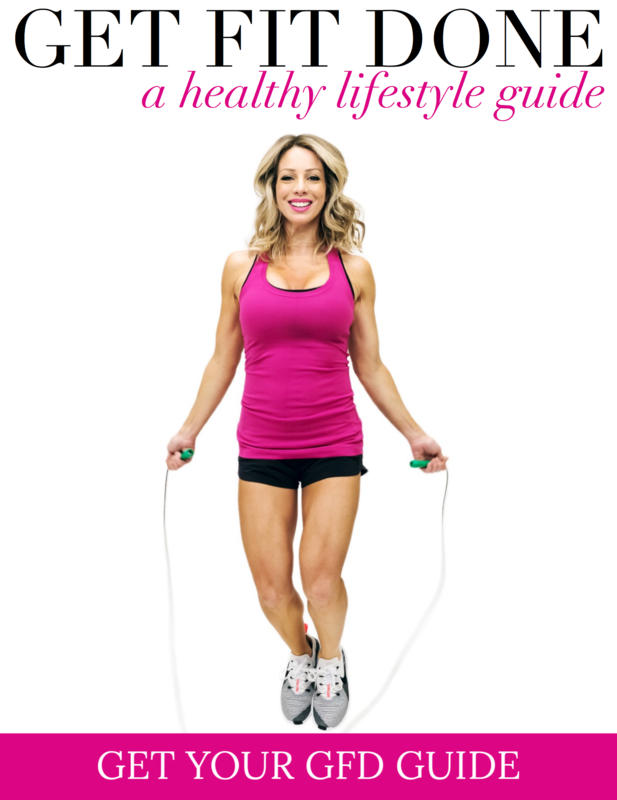 Friends, please let me be the one to save you the embarrassment of those saggy, baggy jeans! They do nothing for your figure. Jeans are so versatile these days and can be worn dressed up or down, for work on casual Friday and even out on date night. 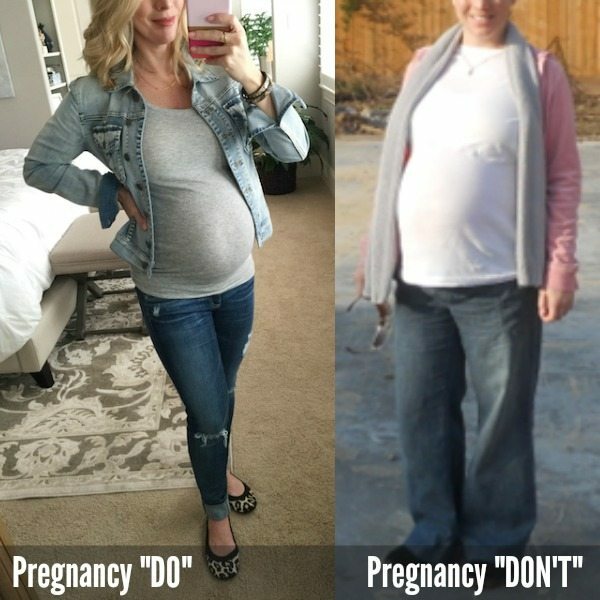 If you wore jeans a lot pre-pregnancy, you’ll want at least a pair or two that you look and feel great in while you’re expecting. 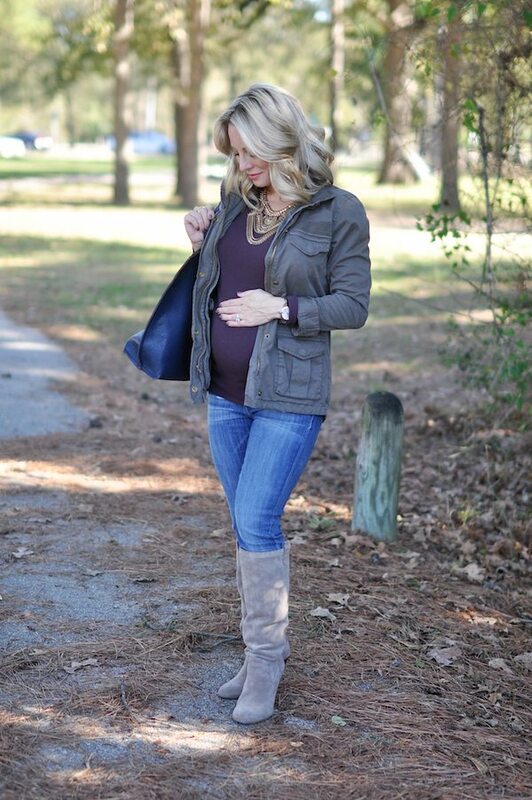 Even “skinny” maternity jeans will look good because they are more form fitting. As soon as your regular pants get uncomfortable and you can’t do the hair-tie trick anymore, I say bring on the maternity pants! Hallelujah, they are so much more comfortable! Styles have come a long way and now the fashionable brands you’ve always loved come in maternity styles with a belly band or side elastic for stretchiness. I didn’t enjoy the full panel until later in my pregnancy, but you can just fold it down if you’re not ready to have it all the way up. The small elastic side inset panel is great, especially at the beginning of your pregnancy. I found I also love the Luxe Essential line of jeans at Macy’s. Be forewarned though, you might still need to go up a size during your pregnancy, so don’t get carried away buying too much at the beginning. Early in my pregnancy, around 15 weeks, I bought size 25 and 26 maternity jeans (my pre-pregnancy size), but at 30 weeks, I found those getting tight and went ahead and bought a size 27. 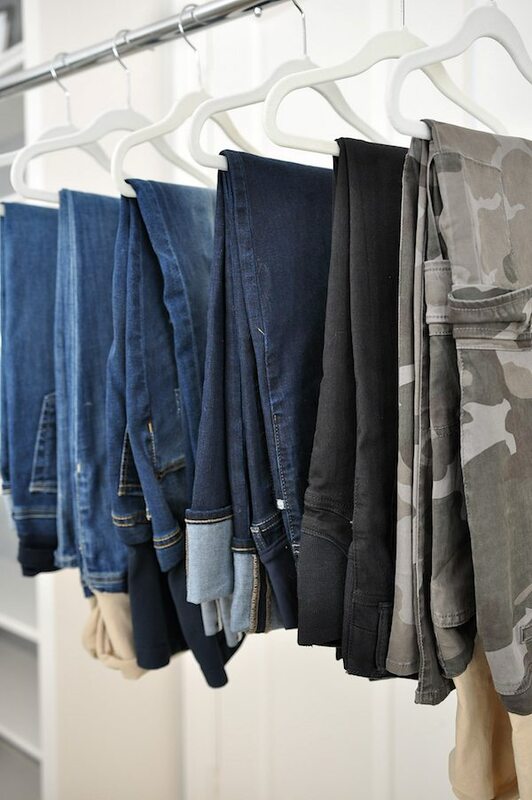 Because I wear them so often being a stay-at-home mom, I’ve invested in several pair of jeans (as opposed to slacks or pants) that would be good quality, fit well, and look good. 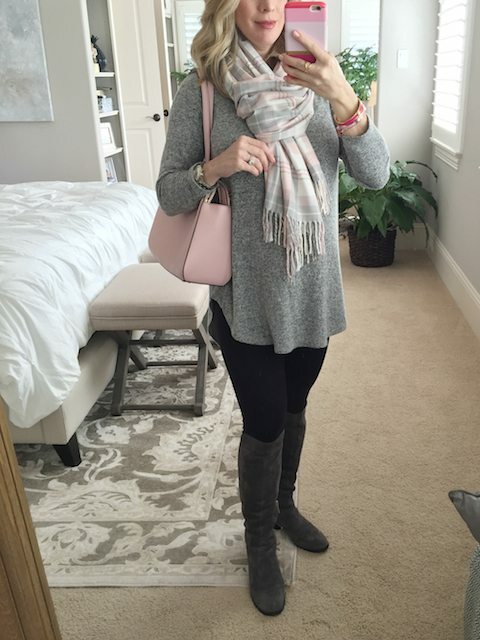 Especially in the 3rd trimester, when your stomach is getting big as a watermelon, the most comfortable bottoms you can wear are leggings, but you can still dress them up with tunics and long tops. Let’s face it, no one wants to spend money on a maternity wardrobe that they’ll only wear for a short time. Unless it’s your first pregnancy and you plan to have more, you might never wear these clothes again, so be wise and choose carefully. You probably don’t “need” as much as you think, although it can be hard to resist all the cute maternity clothes they have nowadays. And truly, when you’re feeling big and sluggish and not that cute, a pretty new top can lift your spirits. At least that was true for me. Before you shop, beg, borrow or steal from your friends. Okay, don’t steal, but ask around because most women are eager to share their maternity clothes because they get it! And if they’ve spent good money on them, they’ll want someone to get more use out of them. This can be tricky though because your friend might not be the same size as you or they might be big-pregnant in winter and you’re at the end of your pregnancy is summer. But, it’s worth seeing what they have and trying on if they’re willing to lend. Also, you might also be able to purchase gently-used clothing if you’re okay with that. In my town, we have a closed Facebook group that is great for buying/selling and I’d definitely buy someone’s old pregnancy clothes because usually they’re in great shape having only been worn for less than a year (unless they’ve held on to them through multiple pregnancies). This pregnancy, I did ask around to borrow things, but my friends are past the maternity stages of their lives and so they didn’t have anything to lend. I really wanted to be a stylish pregnant mama (especially after having been so NOT stylish the first time around), but I’ve managed to only buy a few maternity tops that I can mix and match and wear with my non-maternity tops. If you do need/want to do some shopping, several stores now have lots of maternity options for you. 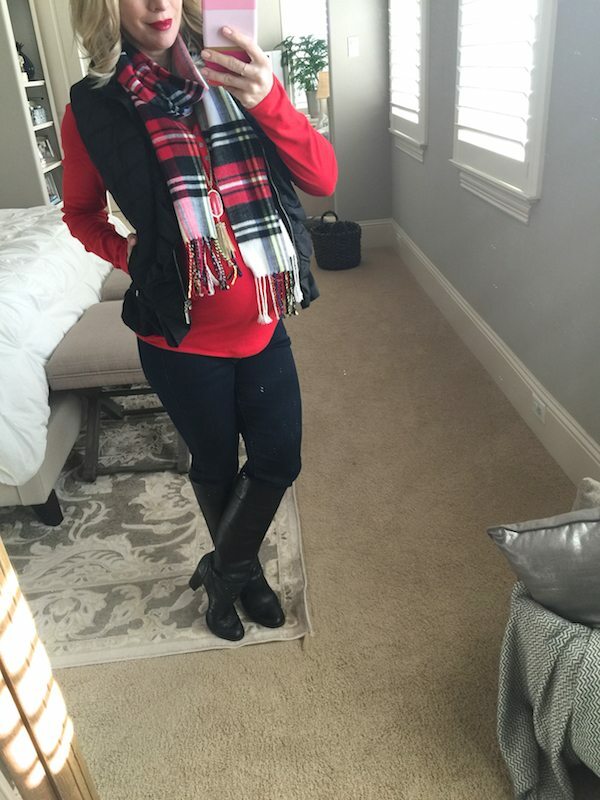 GAP – GAP has good quality maternity clothes and everything I’ve bought from there has held up really well. GAP was my go-to for work appropriate clothing during my first pregnancy too since they carried decent slacks.H&M – I only just realized that H&M sells maternity clothes and they have some tops that are adorable. I can’t vouch for the quality yet since I don’t personally own any, but I’m planning to order a couple because I’m curious and want to be able to tell you from my own experience. Loft – Especially for the working mama, Loft has stylish classic pieces that can be worn at the office and you’ll still look professional and put together. Macy’s – Macy’s has been a great find for a huge selection of maternity clothes. They’ve got lots of options and brands to choose from. I love the Luxe Essential line of jeans and also the Jessica Simpson brand in general. Really cute things at reasonable prices. Plus, Macy’s is always running a sale or has coupons available with free shipping and free returns. Nordstrom – Nordstrom has a good selection of on-trend maternity wear, but the bummer is it is online only. I wish they carried maternity wear in the store so you could try on before you buy. The good thing is that they offer free shipping and free returns, so don’t feel bad about ordering two sizes and returning the one that doesn’t fit. Also, the reviewers on Nordstrom’s site are usually pretty accurate, so you can get a feel for how others felt about the item by reading the reviews. Old Navy & Target – both stores have budget-friendly basics and surprisingly stylish options. Their online selections are usually better than the options available inside the stores. Old Navy offers also has maternity workout wear that I’m in desperate need of. Okay, I know this post was long, but I wanted to pack in a lot of helpful information for you. Please let me know if you liked it and want to see more. I still have two months of pregnancy left! 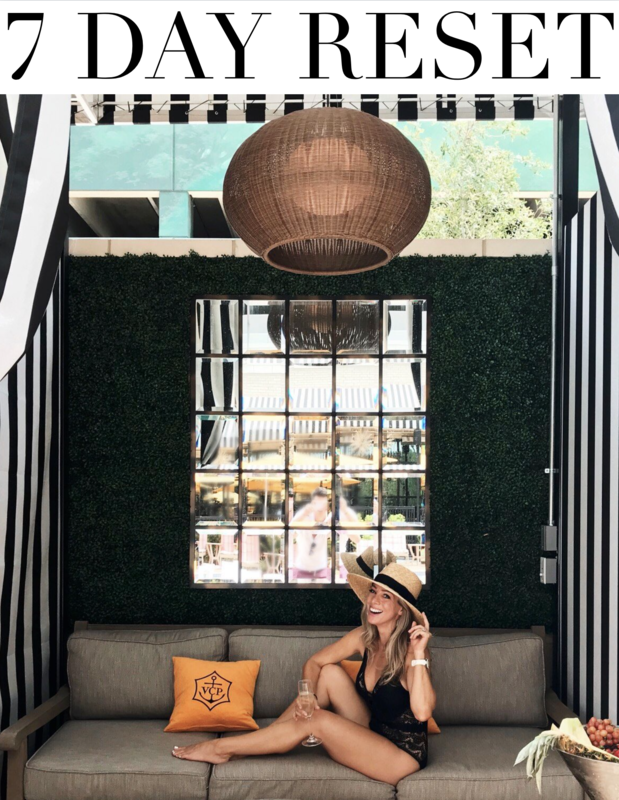 You can read all of my pregnancy posts on my FITNESS tab at the top of my blog and see more pregnancy style on last week’s edition of Weekend Steals & Deals. Yet another great post! 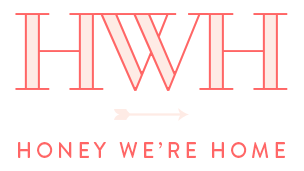 Reading your blog is one of the highlights of my morning, along with my coffee. You look absolutely fabulous! Congrats!!! Oh Jessica, I love to hear that! That's how I like to spend my mornings too! I definitely agree about investing in good quality maternity pants! After the hair tie trick stopped working, I bought a cheap pair of jeans that were not the style I go for and they were so uncomfortable and I decided to invest in better quality that fits my style and it was worth every penny! 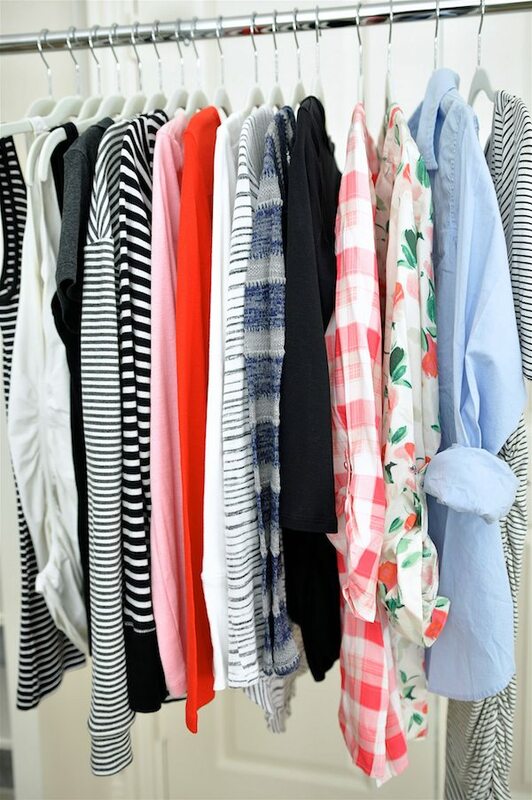 And I have borrowed a ton a shirts from my friends and shopped second hand and I feel I have a great selection to mix and match and stay true to my style!! I had the worst jeans ever my first pregnancy and looked terrible. I'm sure I didn't want to spend the money on clothes I wouldn't wear for long, but this time I decided it was worth it to feel better for those long months when you're not feeling that cute anyway. I'm going to try to sell them later! You are so darling pregnant. You've looked amazing the whole time, friend. I agree. I remember investing in a really nice pair of jeans that made me feel great. Other than that it was a lot of mixing and matching and accessories. But I never looked as cute as you. I need to see you pregnant, I don't think I have! I bet with how tall you are you barely showed! Love that! My maternity soft pants are getting worn out! I was hoping I could make them last the whole pregnancy, and I think I can, but they are definitely getting their money's worth! Yay for more babies! I hope you're feeling good! Wow!! 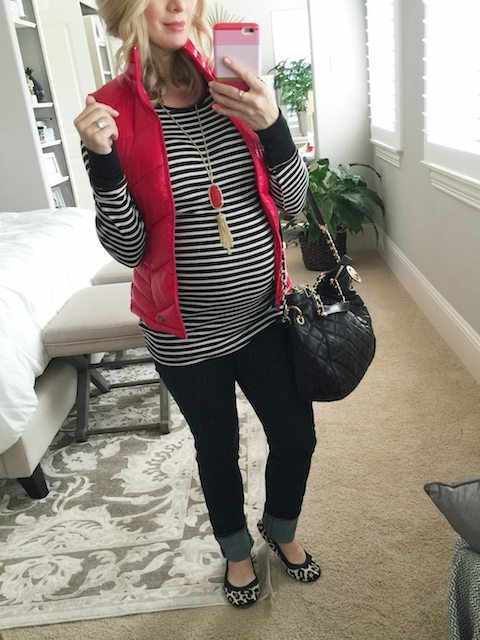 This post is great…such a useful resource for future mamas out there that want to look chic!!! you are the cutest pregnant girl ever!!! Thanks Cass! It took me a long time to put together and I know you know the effort we put into these posts. I hope people find it helpful! Yay Sarah! I'm so happy for you! Being a mom has been hands down the very best thing in my life. Sending best wishes for a healthy and happy pregnancy for you! This is great! I don't know if you read the book "Baby Bargains," but I found it really helpful as a first time mom. This post is like a current, visual example of what they recommend. (Not to mention, it is strikingly close to what I ended up buying for my maternity wardrobe!) I'm now a mom to 8-week-old Bradley, and really hope you do a post like this for post partum / nursing — because there I am totally lost! (There WASN'T a chapter on that in Baby Bargains!) Thank you for this. This is such a great post for pregnancy mother. Such a useful resource for future mamas out there that want to look chic. I think every pregnant mom have to know these and hope so these are all tips very helpful for them. Thanks for the sharing such helpful article.